Looking for a rustic or log cabin chair? 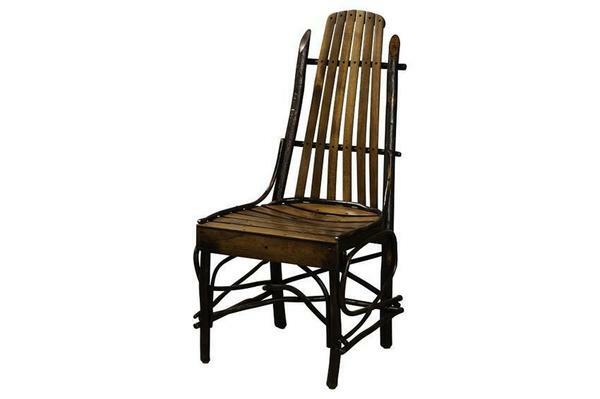 This Amish chair is made of a mixture of rustic hickory sapling wood and then the slats in your choice of hickory, rustic alder, red oak, cherry, maple or walnut. All of our furniture at DutchCrafters is handcrafted in the USA. This rustic hickory furniture is handcrafted by an Amish father and son in Indiana. The pride in their work is reflected in the quality. Call one of our helpful Amish furniture specialists with questions or ordering assistance on these rustic dining chairs. This Amish Hickory Wood Chair is a perfect choice for your rustic dining room or a country style restaurant. No two hickory chairs are exactly alike because each of them is made to order by Amish wood workers dedicated to their craft. This hickory chair will become an heirloom that can be passed on from generation to generation. Enjoy a hickory chair that is made in the USA and uses wood that is grown quickly from forests that are harvested every 3-5 years. The Blue Mountain Hickory Deluxe Table Chair usually ships in 5-10 Weeks.